Officers at Ayr are appealing for information on the whereabouts of Sara Findlay (18) who was reported to police yesterday as missing since Friday 1st March 2019. She is believed to be in the company of her male friend and was last seen on 10th March in Gorgie Road in Edinburgh. She is described as white, 5ft 2 inches in height and of slim build with collar-length brown hair. 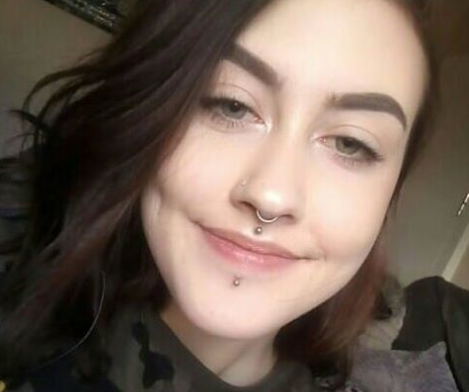 She has a number of piercings in her lips and nose and when last seen she was wearing a black jacket, black hooded top, black trousers, black boots and a black hat. Fraudsters in the UK purchase victim’s personal details that are obtained through the spread of Trojan malware. Victims detail packages are purchased from overseas criminals specialising in the collection of compromised personal data to sell. Specific data is extracted, namely online bank account details and statements. Using the victim’s banking details to gain telephone access to the bank account; the fraudster then opens a parallel business account in the victim’s name. Opening a business account is subject to less stringent security checks once an individual already has a current account with a bank and helps make any transfers of money in the future less suspicious. Details of the victim’s mobile phone, again extracted from the purchased personal data package, are then passed to an individual who specialises in the SIM Split step. •Contact details and security questions may be changed with the phone provider as to further frustrate and hinder the victim from reporting the fraud. As soon as the SIM card is activated the SIM Splitter contacts the fraudsters and tells them to transfer funds from the victim’s current account into the newly set up business account. As a security measure the banks will often make a call or send a text to the phone number registered to the account to confirm if the transaction is genuine. The SIM Splitter agrees to the transfer when contacted and disposes of the SIM card afterwards so not to be traced. The fraudsters can then withdraw or transfer funds away from the business account with a lower level of scrutiny whilst maintaining a certain level of access and control of the account with the stolen details. During February 2019 a further incident has been reported to Police Scotland whereby a voicemail was left on the victim’s phone stating that they were owed a large amount of PPI. The victim returned the call and spoke to a male who said that they required an admin fee of £200 to be made by purchasing Google Play or Steam Cards. The victim attended their local supermarket to purchase the cards then called back to provide the codes. The caller then asked for a tax fee of £500 to be paid before the PPI could be released. The victim returned to their local supermarket, purchased the cards, called the fictitious PPI company and were told that the claim would be delivered in person within 30 minutes. No PPI was paid. This scam has been reported to RAC since August 2016. Members of the public have been contacted by phone and advised that they have an outstanding debt to a Government agency such as HMRC (Her Majesty's Revenue and Customs) or DWP (Department of Work and Pensions) & more recently requesting amounts to be paid to unlock a PPI claim. The scammers request payment via ITunes Vouchers or Store Gift Cards and more recently Google Play or Steam Cards. The scammers do not require to have physical control over the card merely the identifiable code on the rear to have control of the cash amount. The victim is instructed to reveal the identifier code to the scammer and incidents have been reported of victims being scammed out of thousands of pounds at a time. In the past victims have been threatened with being arrested by the caller. Supermarkets have been very proactive in their efforts to take preventative measures to safeguard their elderly and vulnerable customers. Please circulate and raise awareness of this scam. If you have or you know someone who has been targeted please contact the police on 101. PLEASE NOTE: VARIOUS OTHER GIFT CARDS CAN ALSO BE USED. We have had an increase in incidents of bogus workmen/doorstep crime in different areas of Edinburgh. We ask residents to be mindful of anyone attending at their front door offering services and always ask to see ID before allowing entry. A male purporting to be a window cleaner has recently been apprehended and charged in the Crewe Road South area of Edinburgh. If you hear or see anyone acting suspiciously in your area please phone Police on 101 or if you believe there to be a crime in progress, 999. Alternatively you can also report incidents anonymously to Crimestoppers at 0800555111. Here is a document which will give you tips and advice on how to prevent your computers / laptops being attacked by Ransonware. When criminals use computer software to gain access to computers to access / remove valuable data in the hope to extract payment form the victims. Although usually associated with businesses, private individuals can also be attacked. Web sites offering further information are also included. I hope you find this information useful and of course please pass it on to any friends or relatives. We are looking for information to trace John Scott, who has been missing from Denny for the past week. John has only recently moved to the Falkirk area having lived previously in Glenboig. The 37 year old was last seen leaving The Royal Infirmary in Glasgow about 12.30pm on Tuesday 20th of November. Inquiries have led officers to believe that John left in his grey Hyundai i20 car registration SH11 FWX and his destination is as yet unknown. There have been no further sightings. He is described as 6ft tall, medium build, short fair coloured hair, stubble. Last seen wearing denim jeans, a grey jumper, black jacket and white baseball cap with a black skip. Those with information can contact Falkirk Police Station via 101 and quote the incident number 3878 of the 21st of November. Police Scotland are raising awareness of a new form of phishing email which is targeting companies and organisations in relation to recruitment and job vacancies. Phishing is when an attacker encourages someone to do 'the wrong thing', for example: disclose sensitive information, click on a link or download a piece of malicious software (malware). Phishing is more commonly carried out via email and social media but can also take place via telephone and text message. These recent attacks have seen companies receive emails containing CV’s in response to job adverts, but clicking on the attached document allows the system to be compromised and may result in malware being downloaded onto their network, often in the form of Ransomware. We would encourage all users to ensure their security software is up-to-date and that their data is backed up regularly. Companies should also remain vigilant when dealing with any unsolicited emails or visiting websites that they are not familiar with. As part of an ongoing project to upgrade the gas network in the area, we’ll shortly begin work in Duddingston (crossroads) area, Edinburgh. This essential work involves replacing old, metal gas mains with new plastic pipe, which has a minimum lifespan of 80 years, to ensure a continued safe and reliable gas supply for the local area. Following discussions with The City of Edinburgh Council, the work will begin on Monday 9 July and last for approximately 10 weeks. We’ve split this section of our project into two phases to help minimise disruption. During phase one we’ll be working at the junction of Willowbrae Road, Milton Road West, Duddingston Road West and Duddingston Road. The existing lights will be replaced with three-way temporary traffic lights, and Duddingston Road will be closed at its junction with Willowbrae Road. We’ll be manually controlling the lights during peak travel times to help reduce disruption. Access for residents will be maintained at all times, and a signed diversion route will be in place via Milton Road West, Mountcastle Drive South and Duddingston Road. During this phase, Duddingston Road West will be reduced to two lanes. Motorists can still travel in both directions. To allow our engineers to work safely, Meadowfield Avenue will be closed at its junction with Duddingston Road West. We understand this is a busy route and will be working extended hours, 7am-7pm Monday to Friday, and weekends where required. We always aim to minimise disruption and we will make every effort to ensure our works are completed as soon as possible. If you have any specific enquiries about this project, please call SGN on 0131 469 1728 during office hours 8am – 4pm or 0800 912 1700 and our SGN customer service team will be happy to help. Please share this information with your colleagues, stakeholders and anyone who may be impacted by our work. You can report suspicious calls like these to Action Fraud by visiting www.actionfraud.police.uk or by calling 0300 123 2040. I am taking this opportunity to make you aware of 2 recent incidents in the Morningside and Grange areas, where elderly occupiers have been approached by a male in his 30's offering to fix loose roof tiles on their houses. For anyone with a Netflix account please be aware of the following ongoing scam. The email header reads “Your Suspension Notification” to create a sense of urgency. The e-mails appear genuine and threaten to suspend the account in 48hrs. If the link is clicked on you are taken to a legitimate looking landing page replete with adverts for popular box sets and films where users are requested to input account and billing details. The advice, as with all phishing emails, is to delete immediately, do not click on any part of the email. If you wish to check an account mentioned in the email, go directly to the site and log in, do not follow links. If the account allows, activate 2-factor authentication which won’t allow a criminal access even with the username and password.